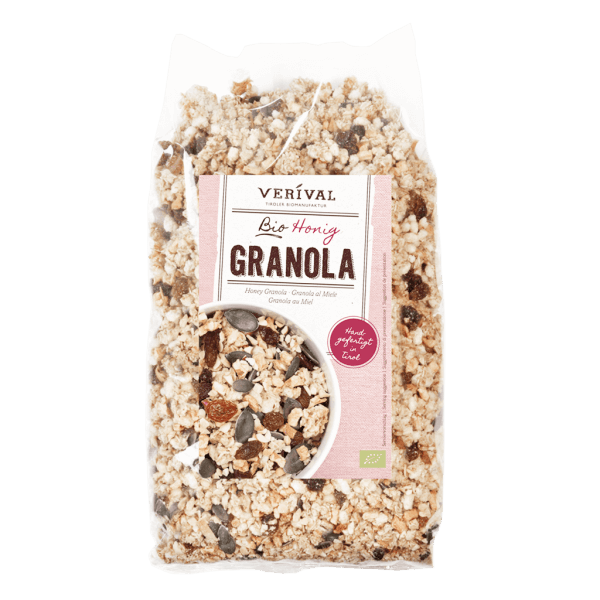 Crunchy clusters of oats and rice crispies – with diced apple, sultanas, pumpkin seeds and chopped hazelnuts. Refined with honey, toasted with sunflowerseed oil (no palm oil!) and mixed to perfection by hand in the Austrian Tyrol. Deliciously biscuity and 100% organic. Good morning! Honig Crunchy* 80% (Vollkornhaferflocken*, Rohrohrzucker*, High-oleic Sonnenblumenöl*, Honig* 9%, Vollkornreiscrispies*, Sesam*, Salz), Sultaninen* (Sultaninen* 99,5%, Sonnenblumenöl*), Kürbiskerne*, Apfelwürfel*, Haselnüsse* gehackt und geröstet.